We can do everything you need to make your event a success. NY Party Works can take care of all the important details with Total Event Planning. We also have some of the most popular and exciting rentals you can find. We’re always up to date with our licenses and we carry up to $6 million insurance. NY Party Works sweats the details and we also make parties unique. Let us show you how. One way to make your event memorable and unique is to go big with it. With warm weather finally here in the northeast, you can have some colossal fun with some of NY Party Works’ outdoor party rentals. And we have some big items that your guests will love! Imagine the majestic feeling of soaring through the air at speeds of up to 21 miles per hour and flying as high as 300 feet. You don’t have to go to an amusement park to feel this sensation, NY Party Works can bring it to you with our Zipline. This zipline can accommodate two people and we’ll always bring you in for a safe landing. That’s because we use a spring-based system that will slow down your landing. Another group of items that are big fun and can be a big challenge are our climbing walls. You don’t have to find mountains or go to a gym to find a rock climbing wall. NY Party Works can bring a 25-foot Rock wall right to your event. It’s big, towering and safe because it comes equipped with a hydraulic auto-belay system. A belay is a device that locks the rope a little at a time as the climber goes up the wall. This rock wall accommodates four people at a time. 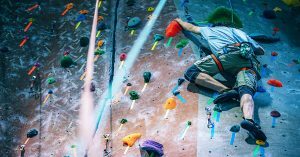 We also carry an Inflatable Rock Wall that also accommodates four climbers. For a unique take on rock climbing, try our Klime Wallz. The design of these walls were influenced by pop art, geometric shapes. All of our climbing walls are perfect for outdoor parties. Almost anything is possible with NY Party Works, we can give your event the feel of an amusement park or carnival midway with our Tubs of Fun ride. It holds up to 24 people and each of the ride’s six tubs spin independently while the entire ride spins in a circle. It’s dizzying fun! It’s time to start planning that big corporate event or outdoor party and you should go big with it. NY Party Works has the biggest, spectacular party rentals you can find. Your event will be unique and promises to be a huge smash. Contact NY Party Works today.